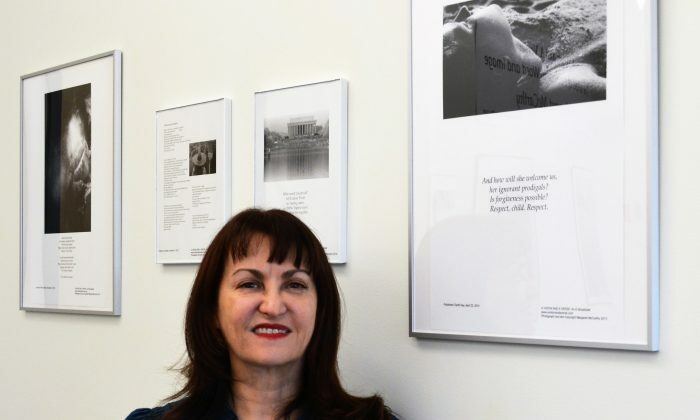 NEWBURGH—Photographer and poet Margaret McCarthy read her poetry and spoke on Aug. 27 at an exhibit of her work at the Mindy Ross Gallery in Kaplan Hall at the SUNY Newburgh campus. McCarthy read poems from her book “Notebooks from Mystery School.” The exhibit A Vision and a Verse: The Wheel of the Year in Word and Image draws from her literary website “A Vision and a Verse” and displays her interplay of photographs and poetry. She publishes what she calls an electronic broadside. “They [broadsides] were just proclamations,” McCarthy said. The present exhibition came from her online publication that began in 2012. As a working photographer and published poet, McCarthy has long been intrigued by the possibilities of combining poetry and photography. The back-and-forth between image and text creates a third thing, something that is more than the sum of its parts. Her poetry comes to her in the way of many poets. “I hear a first line or it will be a certain rhythm or be something that catches my ear.” Her poems are about nature, the natural world, and how human beings fit into that world. She characterizes her poetry as neo-romantic in style. McCarthy became entranced with early Celtic poetry, much centered on the beauty and majesty of nature. “I loved early Irish nature poetry that the early Irish monks wrote,” McCarthy said. She said archetypes in myths and dreams inspire her. I started from the point of view that the photograph has to be strong enough that it doesn’t need a poem, and the poem has to be strong enough that it doesn’t need a photograph. Then her poetic talents developed, and she took her writing as seriously as her photography. Soon she began to see that both arts had the same concerns that moved her. She said the combination is like two instruments in an orchestra make a third sound when played together. Her “Notebook from the Mystery School” is like a coming of age journey. The artist started with film for her photographs, then color slides. She used black and white high speed infrared film because infrared reacts to heat as well as light and shows a different part of the color spectrum. McCarthy experimented with a 4×5 Burke and James field camera for large format photographs. She now uses a 35mm Nikon for most of her present work. A graduate of New York City’s School of Visual Arts, McCarthy works as a professional photographer in New York City. The artist has been writing poems and taking photographs for 35 years. A Vision and a Verse will be on display in the Mindy Ross Gallery, Kaplan Hall until Oct. 6.